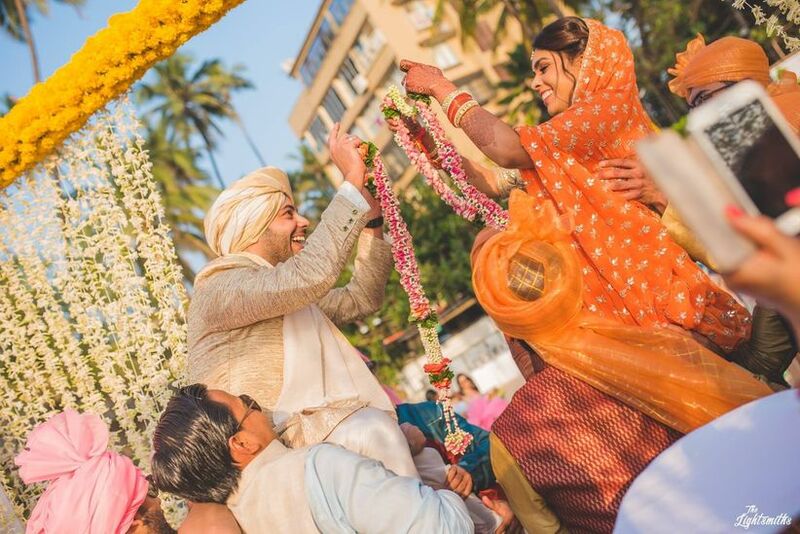 All That You Need to Know About Gota Patti Work to Style It Right for Your Wedding | Wedding Tips ARE YOU A VENDOR? Gota Patti work has always been a winner in the bridal trousseau game. But do you know what it actually is and how you can source authentic gota patti work? Read further to know it all and more! If you want bling in your trousseau but don't want to carry around a lot of weight, Gota Patti work is your saviour. It is not as heavy as mirror work and nowhere near the weight of precious jewels. You can roam around carefree in a gota patti lehenga or carry around a gorgeous gota patti Potli. You can even pick your Mehndi jewellery to be gota patti inspired. 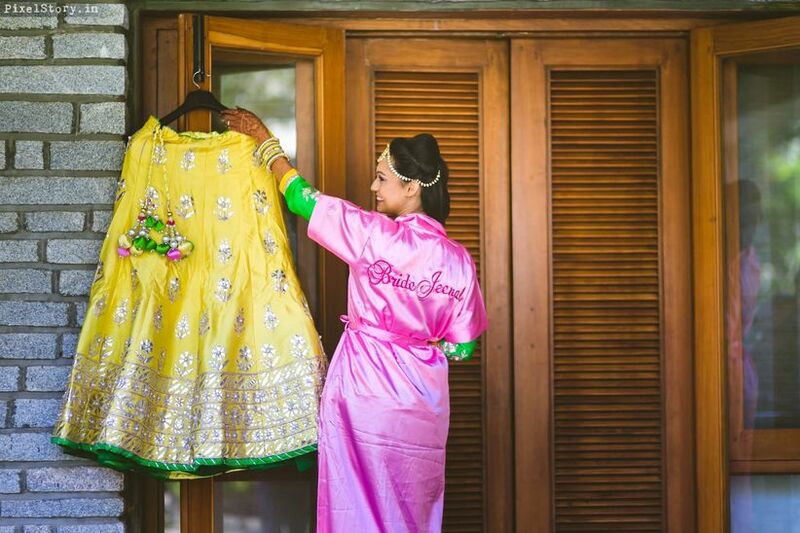 If you want more reasons to get convinced for the fact that gota patti is a super bridal trousseau hack, read on. These images will surely change that sceptical feeling of yours. What is Gota Patti Work? Gota Patti or Gota-Kinari work is a distinctive embroidery which originates from the state of Rajasthan, India. Popular since the time of the Mughals, an appliqué technique is done to get the end results of the embroidery. Small pieces of Zari, mostly in gold, silver, or copper is sewed down to the fabric to get intricate designs. How do I know it’s authentic Gota Patti Work? Gota patti work can be found extensively in fabrics, jewellery, and accessories but how do you know it’s authentic? One fact that would help you tell between real and fake is that gota patti work is done using metal and therefore also called metal embroidery in parts of Rajasthan, it’s parent place. Traditionally, it was done with real silver and gold; however keeping in needs of the contemporary consumers, it is done with other non-expensive metals like copper and others. So, if the embroidery is done using only fabric gota or thick metallic paint with the edges sewn down, it’s not worth it. It’s authentic only when appliqué technique is used to set the pieces of metal (very thin layer of it) and form the gota patti design. Where can I source it from? The best of the lehengas and Ghagras with gota patti work are made in Rajasthan. But now, it is locally available at your designer’s shop or any reputed fabric shops. Accessories and jewellery in gota patti can also be sourced from shops selling such bridal stuff. You can also request them to source it from gota patti traders from Rajasthan. 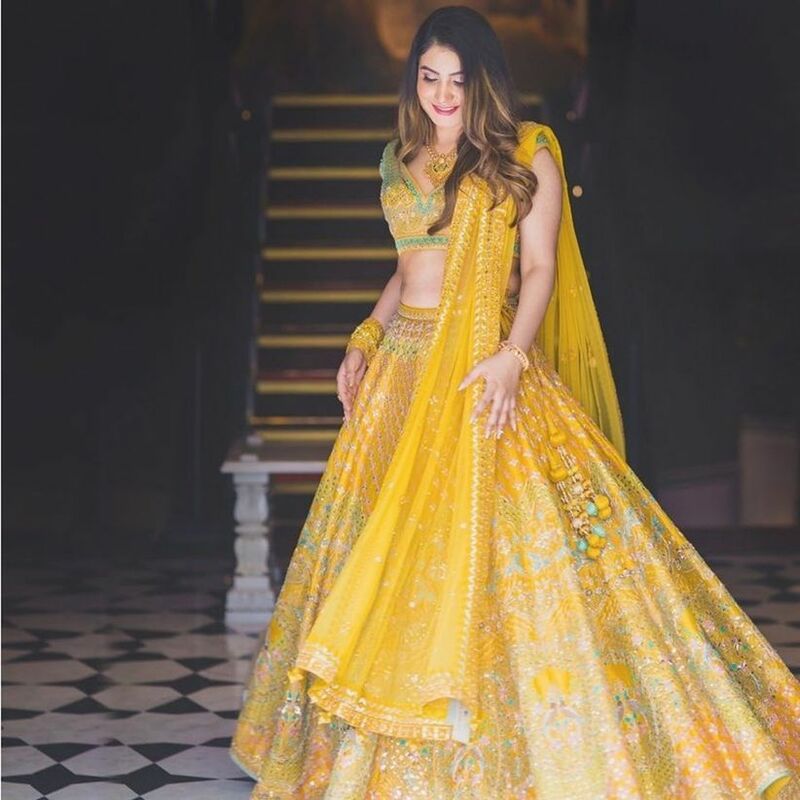 Anita Dongre sported a whole collection reviving this intricate art form of gota patti work lehengas in 'Odessy' Autumn-Winter 2018. How much does it dent the pocket? The fabrics with gota-patti work start from ₹250 per metre and can go up as per the quality of the fabric and the work done. Gota patti jewellery is exceedingly popular among brides for their Haldi function. If you just want the earrings, the price starts at ₹200 while the entire set with earrings, maang tikka, ring, and necklace can cost you around ₹1000 or more depending on the design and quality. 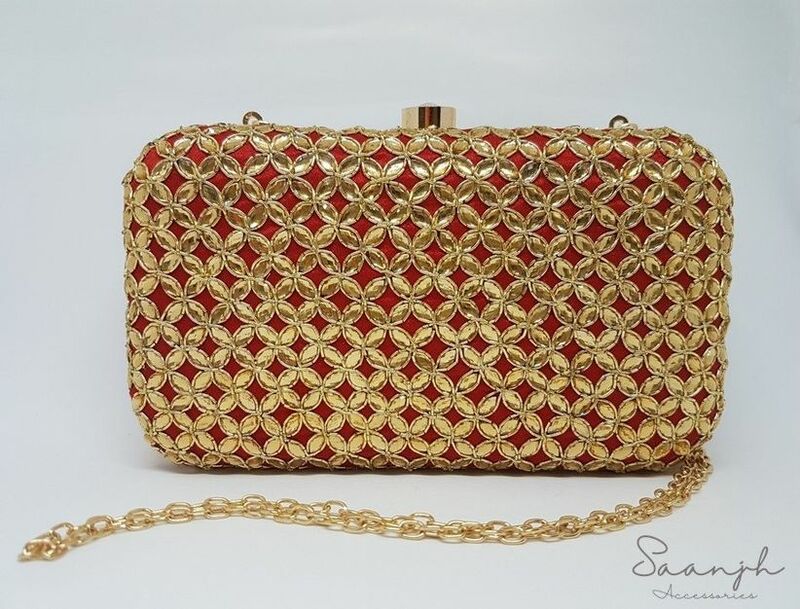 Other accessories where you can find gotta patti work include jutti, clutches, sling bags, potlis etc. Here the price varies depending on the quality of the stuff and the work done on them. Laces with gotta patti work can be sourced for around ₹150 per metre. 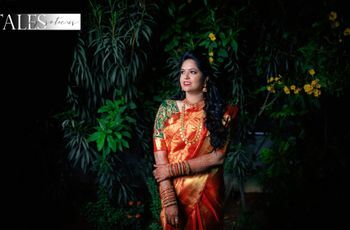 Readymade suits or suit fabrics starts from ₹1500 and lehengas depend on the designer and the eminence of the work; it starts from around ₹20,000-₹25,000. 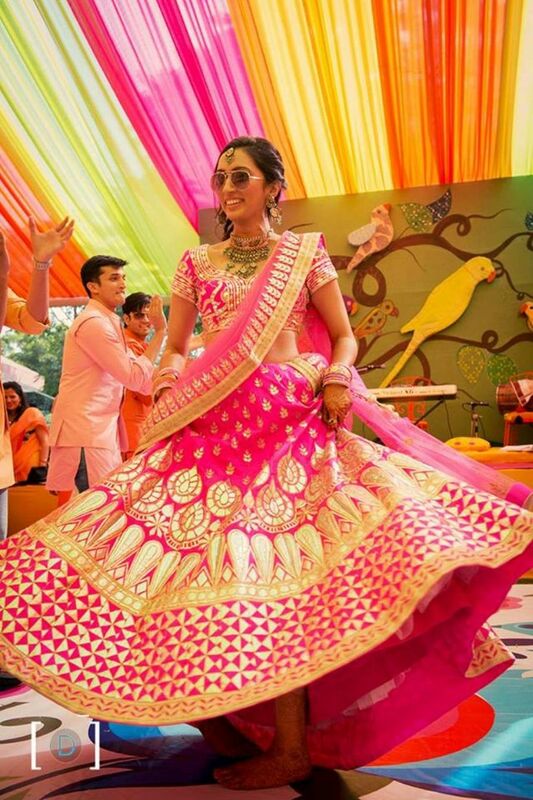 Look at this dream lehenga in pink! It is intricately designed with gota patti work and paired with a net dupatta to complete the look. If you want it heavier, you can also match it up with a gota patti dupatta. 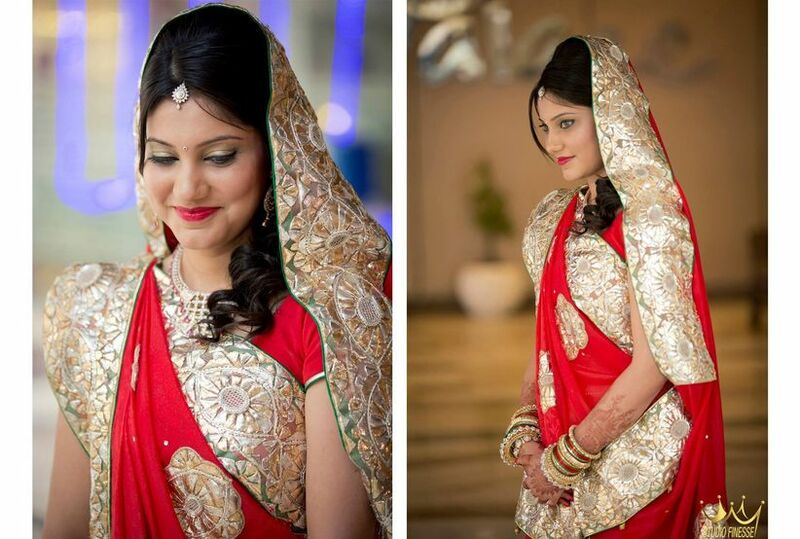 Are you the bride who always dreamt of gleaming in red on her wedding day? Well, here’s how you can make your dream true with this gota patti red lehenga. Colour pink seems to be the most favourite among brides when it comes to gota patti work. Here, the bride chooses lively and clear motifs done intricately by the designer. 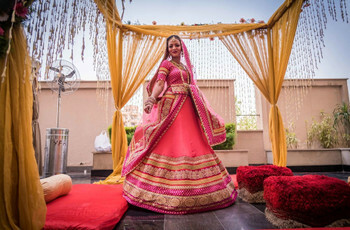 Like this bride, you can also choose it for your Sangeet function as gota patti lehengas are lighter in weight and hence won’t interfere with all the dancing. 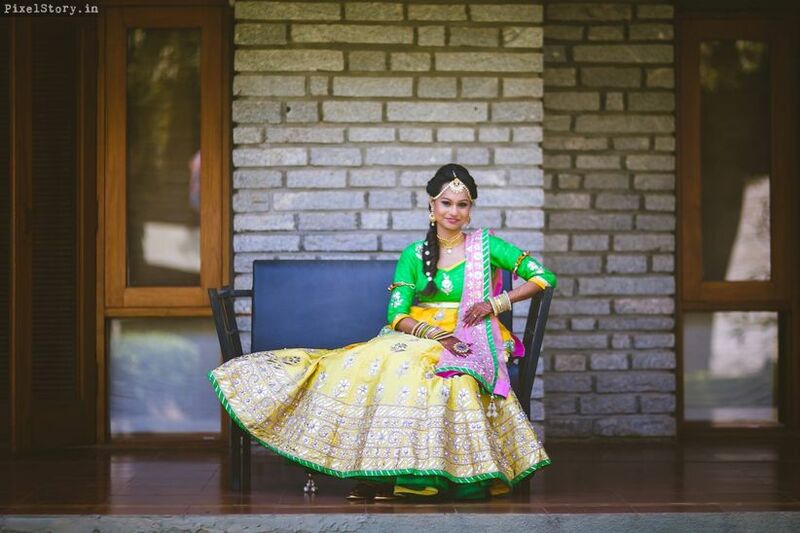 If you are one of those brides who like it unconventional, ditch red and pink and go for this lovely green and yellow gota patti lehenga for your wedding. This ghaghra choli is a perfect artefact of the traditional Rajasthani art of gota patti work. 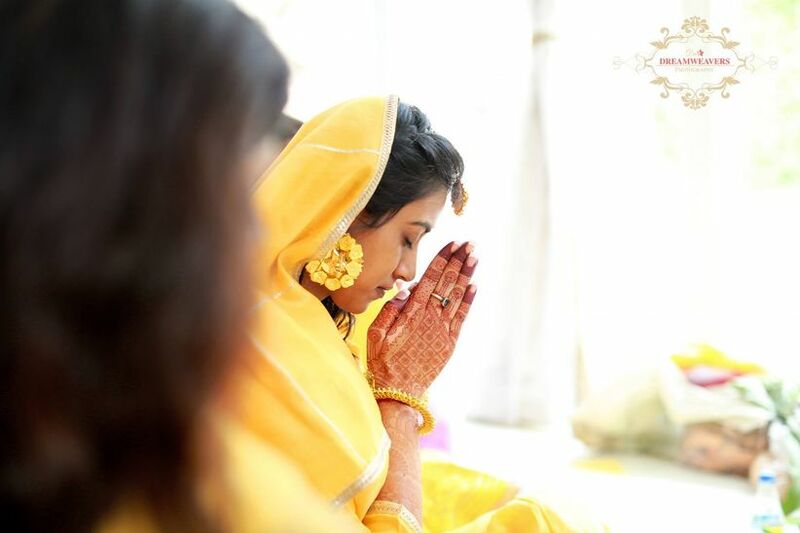 If you want a traditional look for your Haldi or even the wedding function, choose something similar to this. 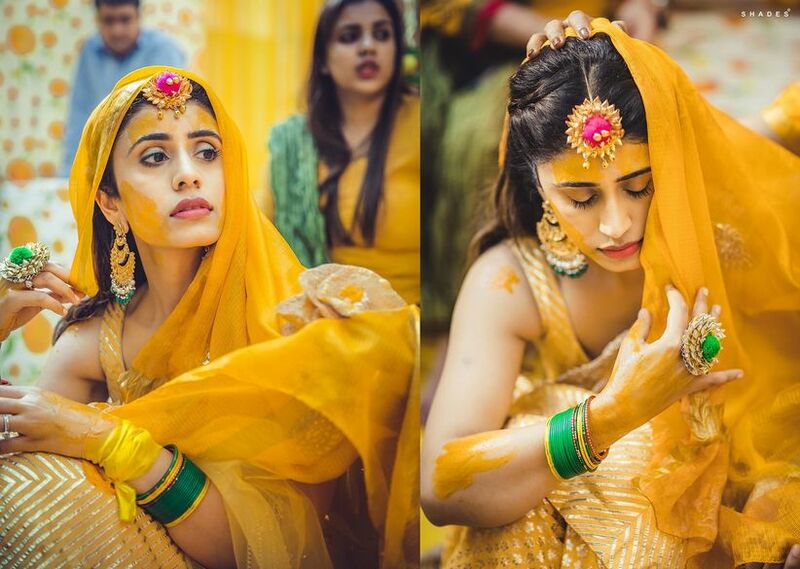 See how the orange ghaghra/lehenga brightens up the yellow background? You will do the same if you choose this ghaghra or a similar one for your Haldi function. 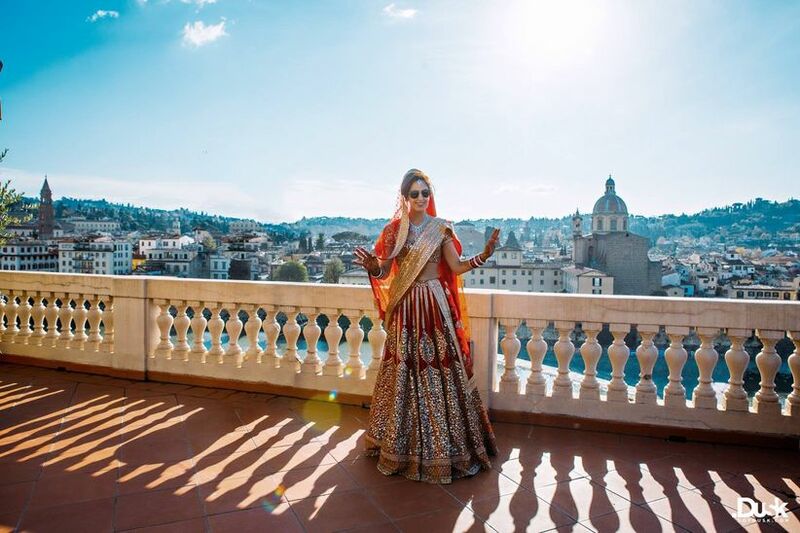 This bride takes up a bold and beautiful bridal photo shoot and shows off her intricate gota-patti choli in stunning pink. We totally adore it, don’t you? 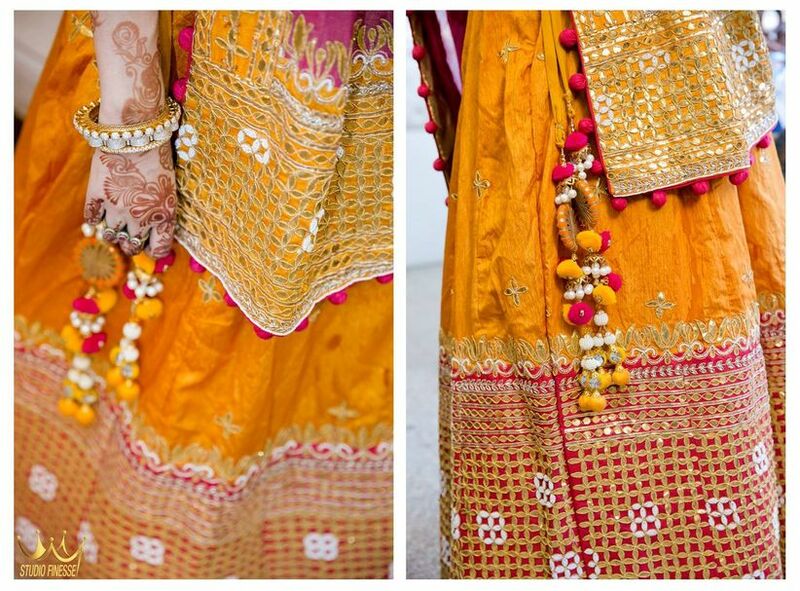 Gota patti lehengas need not always be intricate and full of work, here’s a bride totally proving the point. 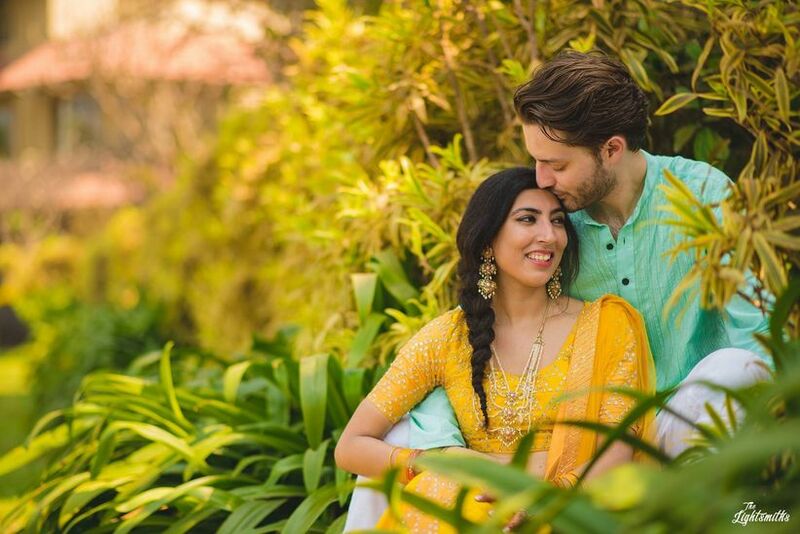 The subtle lehenga is perfect not only for your Haldi ceremony but is also a great option to enhance your couple pictures. 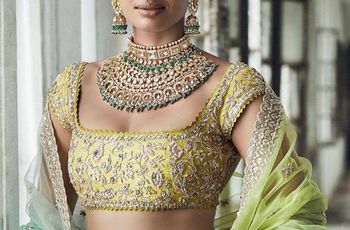 As the lehenga is minimalist, you can pair it up with long earrings and a necklace to go with it. 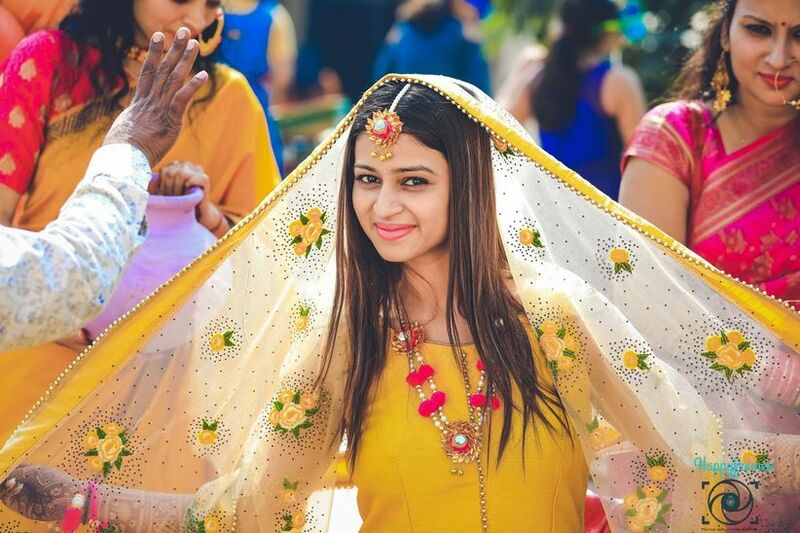 Lehengas aren’t the only option you have, gota patti work looks beautiful in the following ways too. 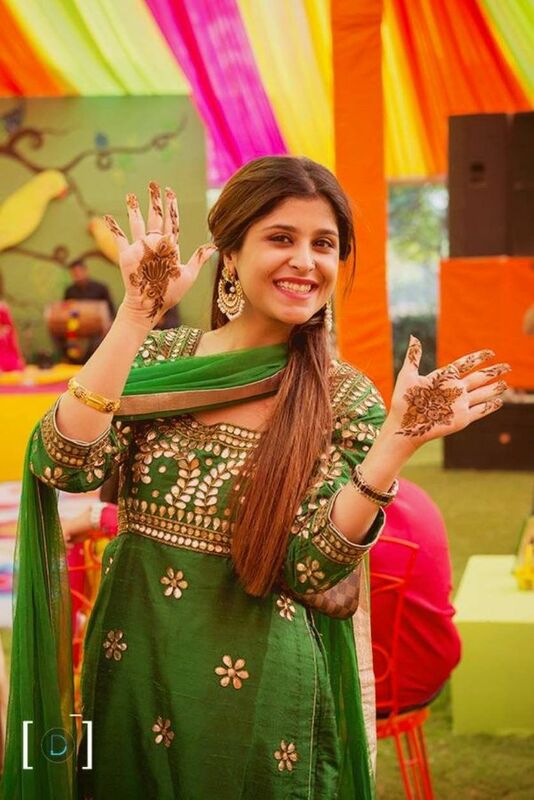 Mehndi Green for Mehndi function, not only the combination is perfect but the gota patti work enhances the look a level up. 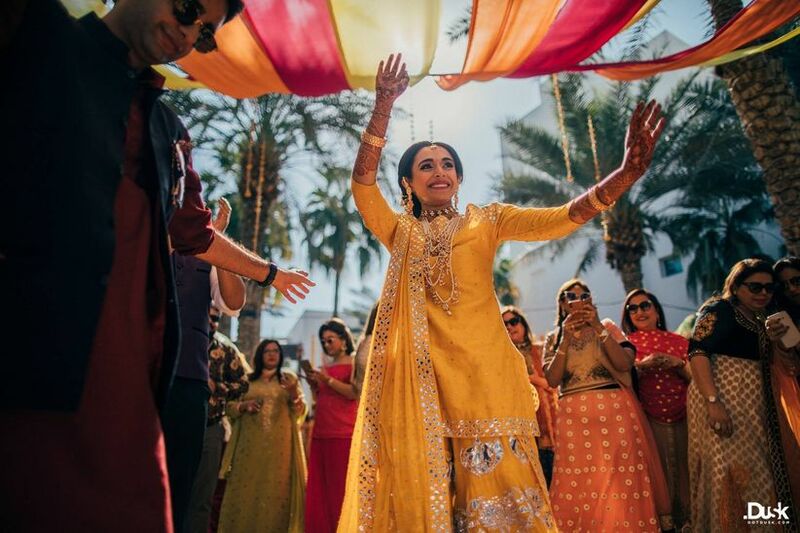 Here one of the bridesmaids is carrying this pretty suit with all grace, you can get a similar one for your Mehndi function or if you are looking for something heavier, get your bridesmaids to get this one. And yes! There are sarees too. This red saree with gota patti work is a perfect choice for your Roka or engagement ceremony. 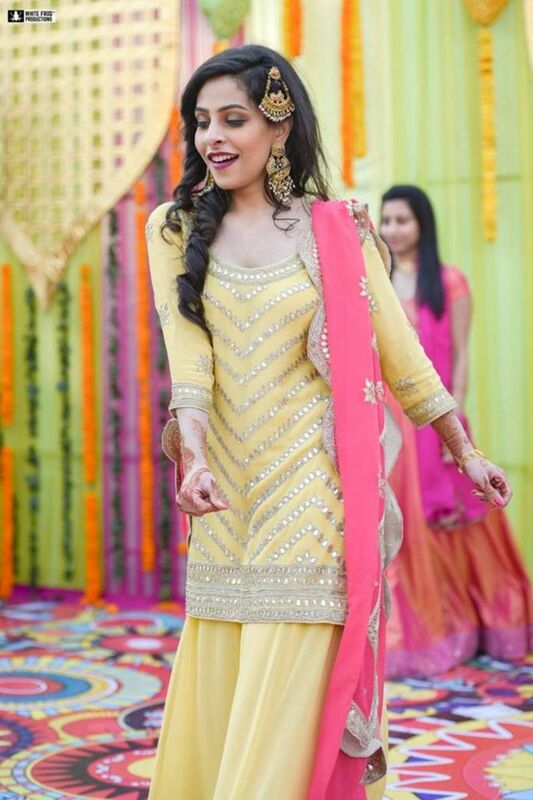 Rock your Haldi or Sangeet function in this wonderful combination of yellow sharara with pink dupatta. A subtle yet pretty gota patti work is done on the kurti and dupatta, which makes them a perfect choice for the occasions. 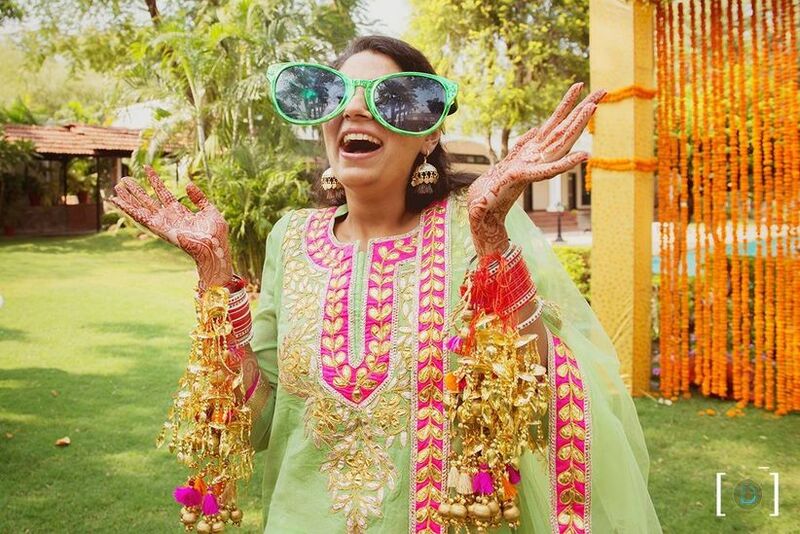 And here’s another fun-filled bride looking perfect in her green and pink gotta patti suit. You can choose the look for your Mehndi function as the colours syncs flawlessly with the theme of the occasion. We call it the showstopper dupatta because here the entire look of the suit is enhanced by the gota patti Dupatta. It syncs well with the Pista green suit with straight gota work. 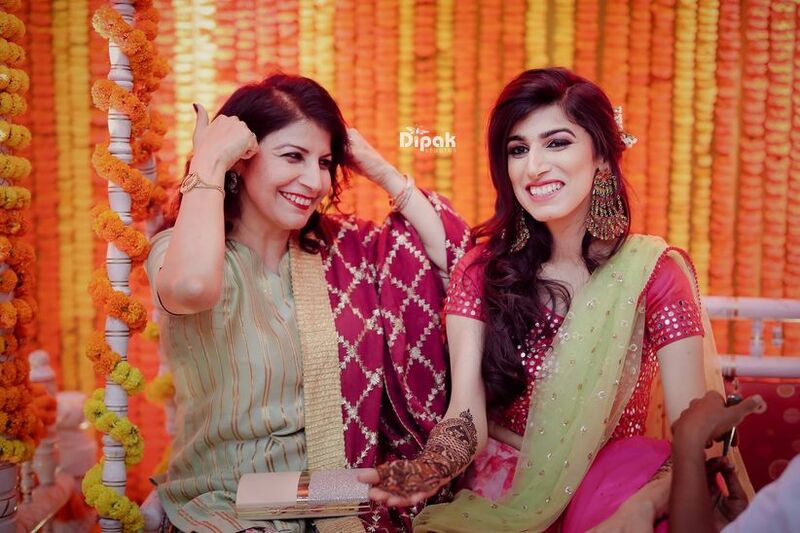 The look can be carried well by your bridesmaids or even the close elders of the family on your Mehndi function. 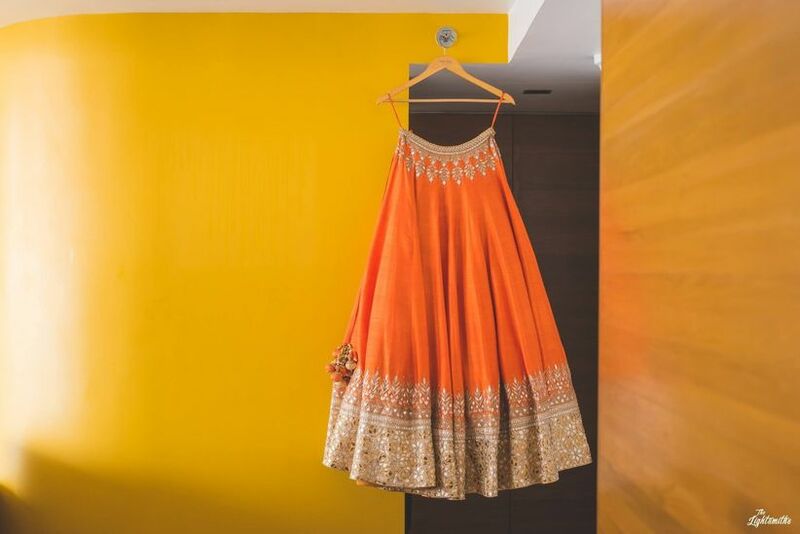 Orange is a life-saver colour for day weddings and this bride is finely proving our point here. She is owning the day with her pretty gota patti dupatta. 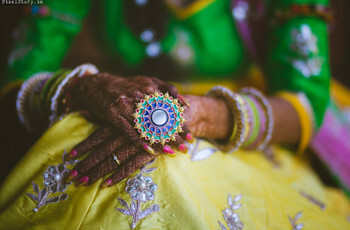 Shades Photography by Ashwin M.
This bride is wearing a plain gota work sharara suit and what compliments and completes the look is her gotta patti finger ring and maang tikka. If your kurti or choli for the Haldi day is plain, try augmenting the look with gota patti necklace. You can also get a matching Mang Tikka to complete the look. And it’s still not the end. Gota patti work is love and love can be found not only on fabrics and jewellery but other accessories as well. Gota Patti work on Potlis gives them a unique look and they ideally complement your party look. As a bride, you can choose it to compliment all your bridal looks. If you choose clutches over Potlis, you can find them too. Here’s a beautiful exemplar for it. We love gota patti work and each one of the above stuff made us go gaga over it. Let us know which ones did strike the chord of your heart!